3. Login to the app. 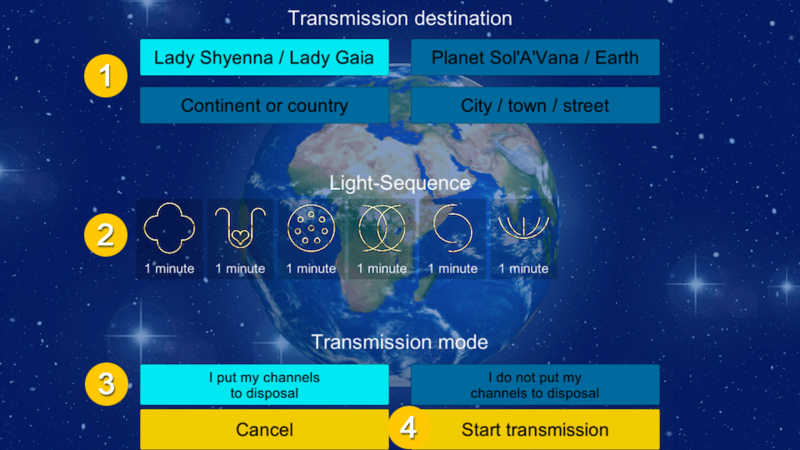 If successful, the module „Planetary Transmission“ is loaded. 4. 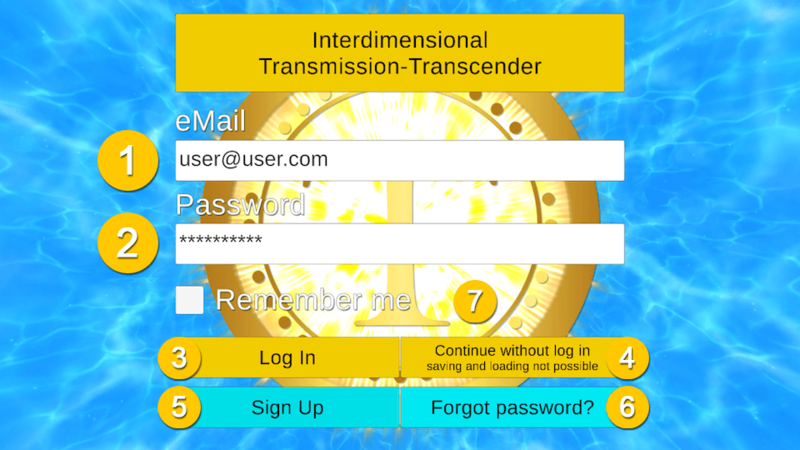 Opens the module „Planetary Transmission“ without having to log in. Please note: Saving and loading the light sequences is not possible in this case. 5. Opens the sign up window where you can register. 6. If you have forgotten your password, you can reset it using this button. 7. If selected, your login information will be automatically entered the next time you launch the app. 3. Login to the app. 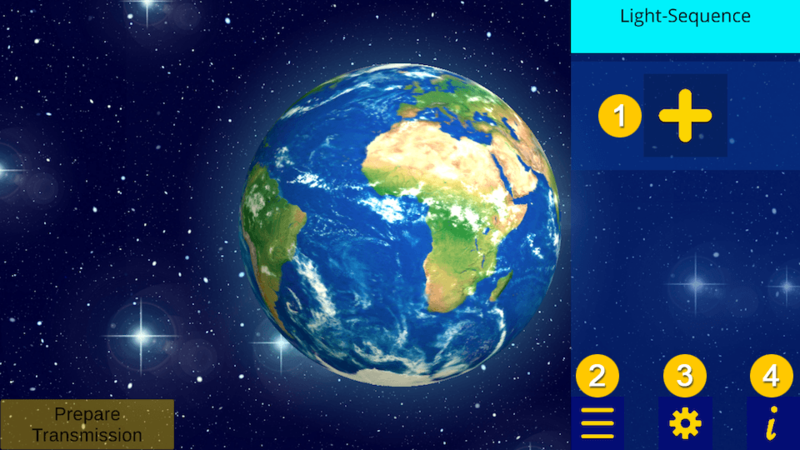 If successful, the main menu is loaded. 4. Opens the sign up window where you can register. 5. If you forget your password, you can reset it with this button. 6. 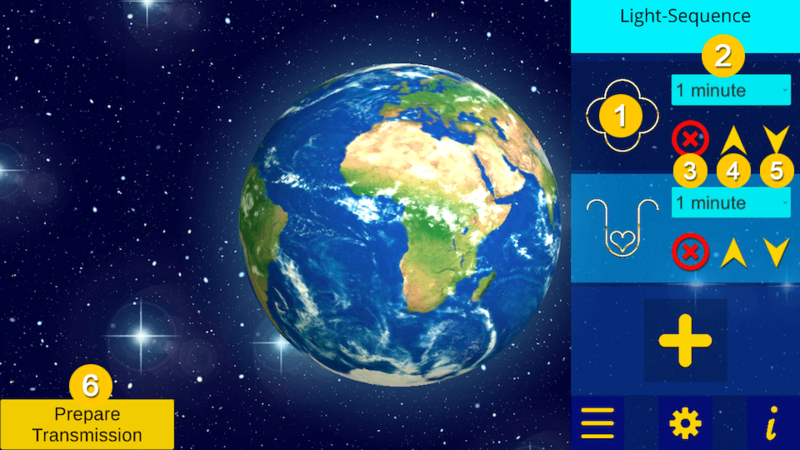 If selected, your login details will be automatically entered the next time the app is launched. Please fill in all displayed fields and press the button „Sign Up“ (1). 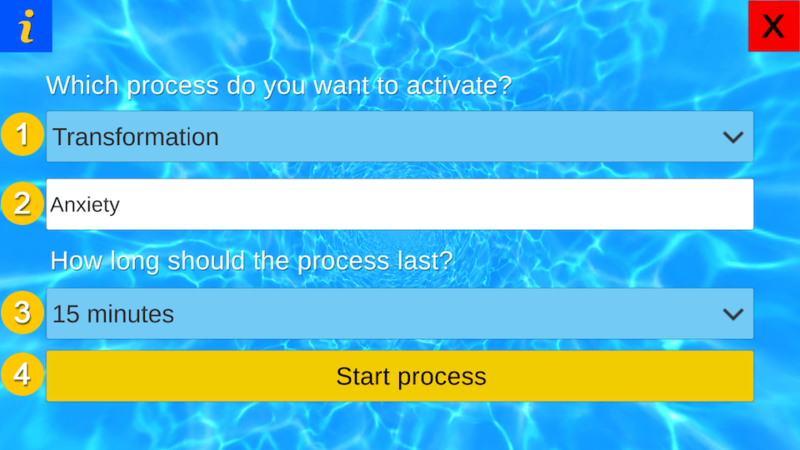 Upon successful account creation, an activation email will be sent to your email address. 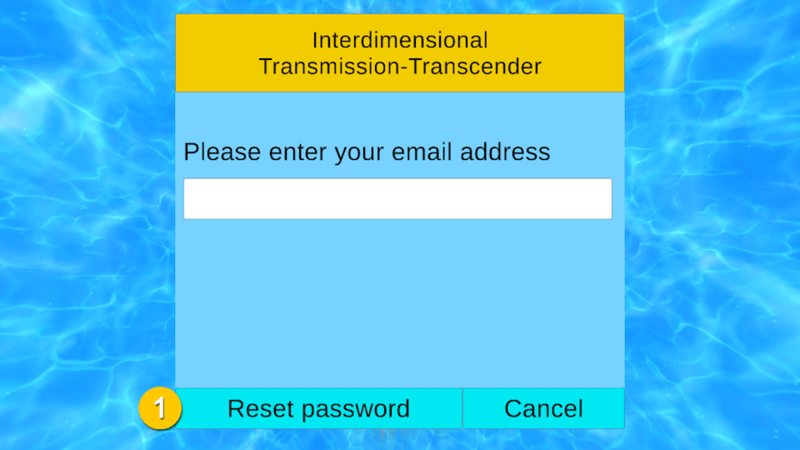 Please open this email in your email program and follow the instructions to activate your account. Please enter your email address in the displayed field and press the „Reset password“ button (1). An email will be sent to your email address. Follow the instructions contained therein to create a new password. 1. Starts the module „Energetic Session“. 2. Starts the module „Planetary transmission“. 3. Starts the module „Energetic Processes“. 4. Starts the module „Direct transmission“. 5. 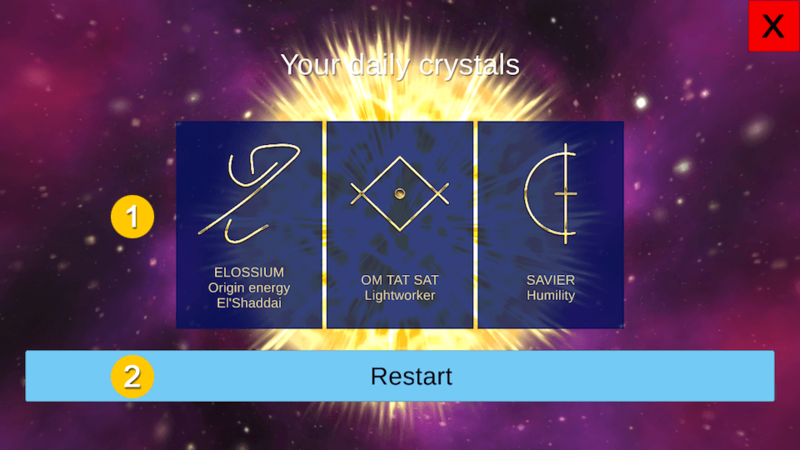 Starts the module „Crystal Oracle“. 8. Opens the „Play Store“ or „App Store“ to give a rating. 9. Opens this help page. !!! PLEASE ALLOW POP-UPs !!! 10. Opens a form with which you can send me a message. 11. 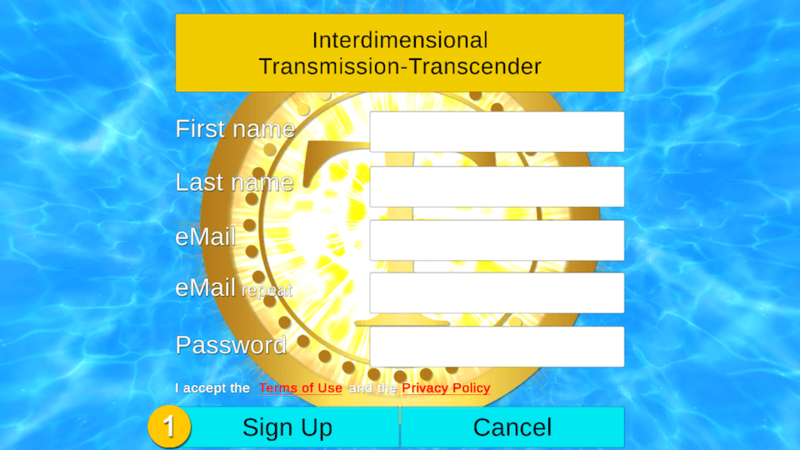 Exit the Transcender app (not available in the browser version). 2. Opens the „Edit recipient“ window. 5. Accepts the settings and closes the window. 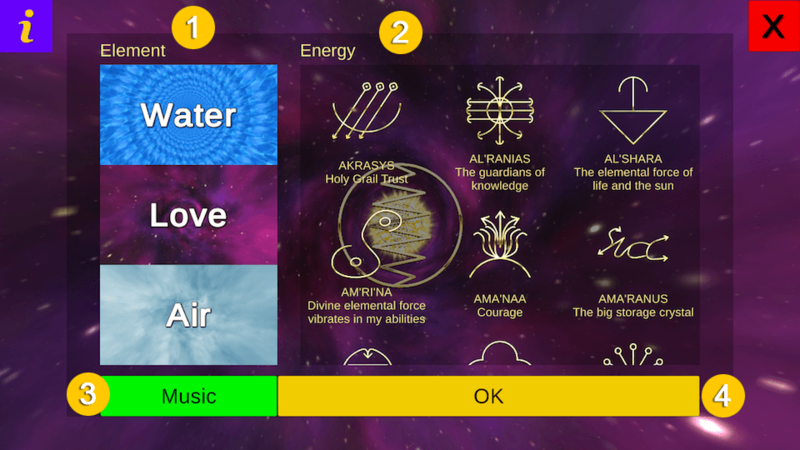 The fields Position, Crystal, Ray Color/Color can be changed/scrolled with a swipe gesture. If you click on the field, an fast selection window will be opened. 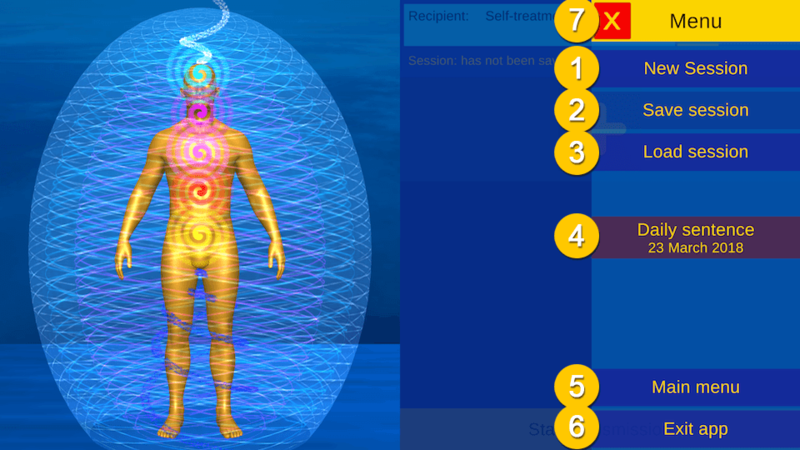 The current values are reflected on the left side of the screen in real time. 1. Selection: Position, swipe or click on the field to open fast selection window. 2. 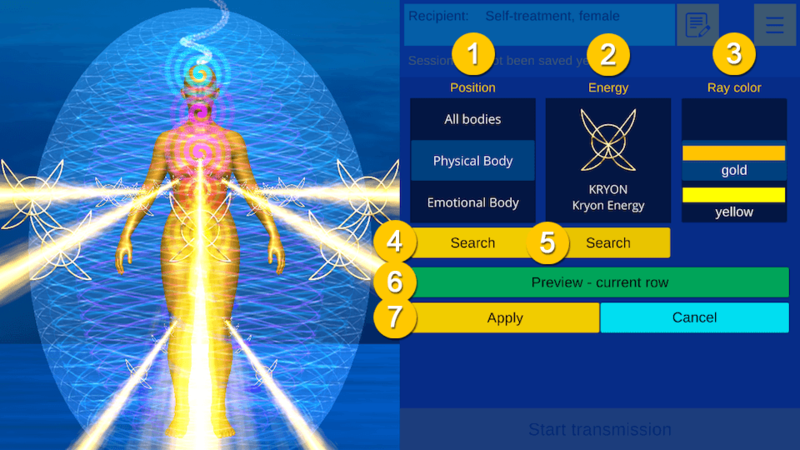 Selection: Crystal, swipe or click on the field to open fast selection window. 3. Selection: Ray color/color, swipe or click on the field to open fast selection window. 7. Add the New Energy to the selected row. 1. Click on the crystal to change this element. 5. Change the length of the row; use the swipe gesture or click on the field to open fast selection window. Take some time before choosing your cards. 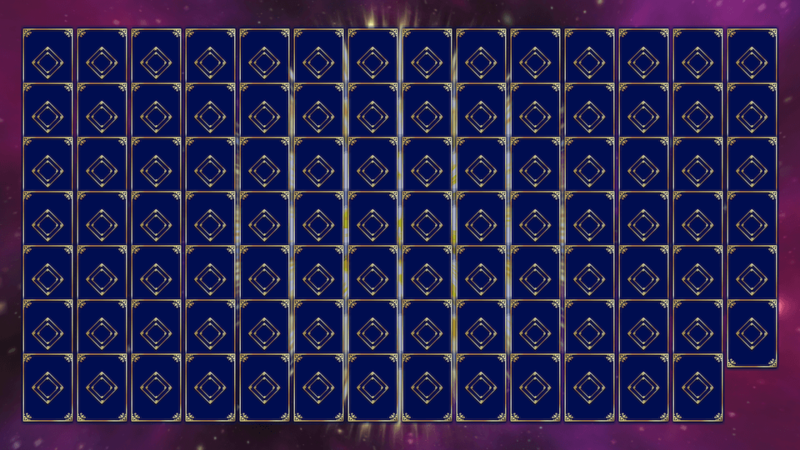 When you’re ready, click on each card. When all the cards have been selected, the window with the result opens. (see next picture). 1. 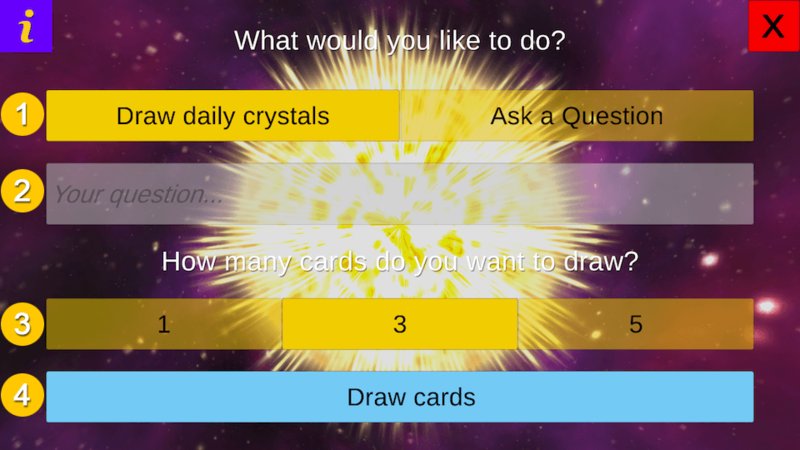 Cards selected by you. Receive notification: If this option is activated, you will automatically be informed when a new daily sentence has been published. 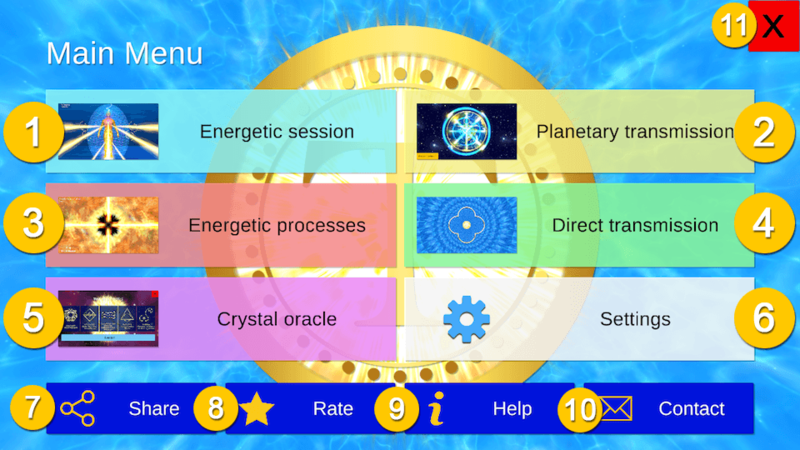 Duration per crystal: Default length per crystal used in the Energetic Session module for Create Session. By clicking on the „Start 30 Days Trial“ button, your 30-day free trial will be started. 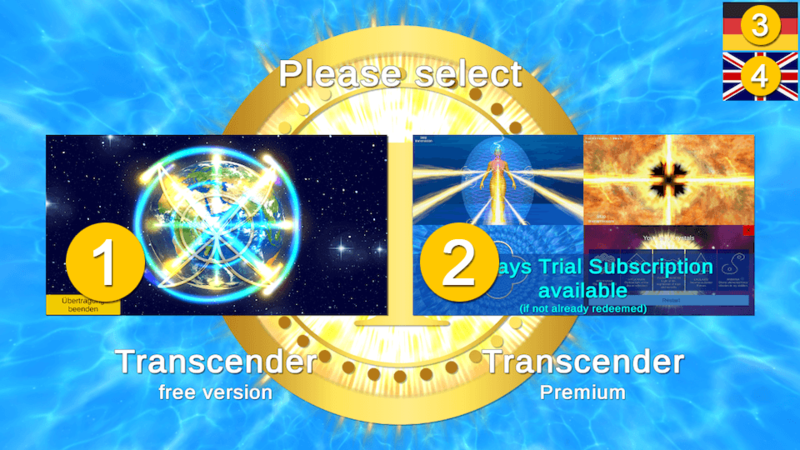 The 30 days free trial will end automatically. This is not a subscription! 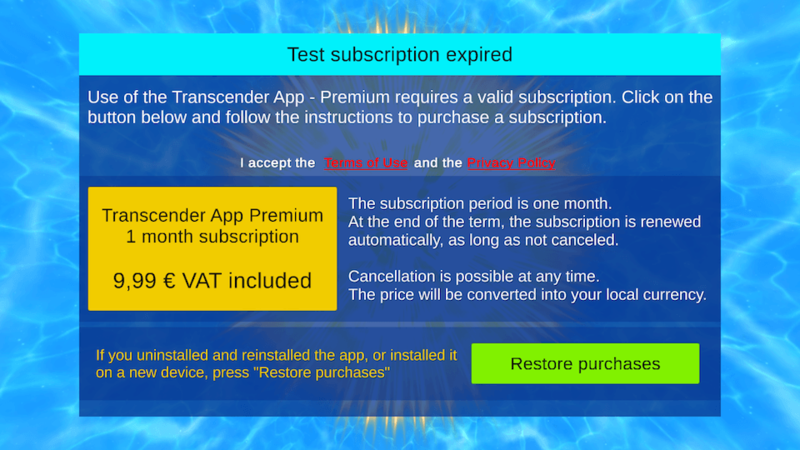 To purchase a premium subscription, click on the yellow button and follow the instructions that appear on the Google Play Store. To purchase a premium subscription, click on the yellow button and follow the instructions that appear on the Apple App Store. To purchase a premium subscription, click on one of the yellow buttons. A new window (see below) will open, in which you can complete your purchase. 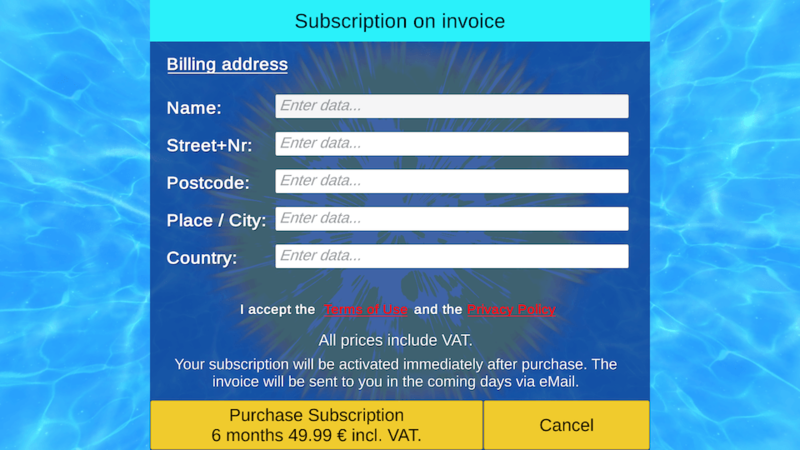 Enter your data in the provided fields and confirm your purchase by clicking on the button „Purchase subscription“. Your subscription will be activated immediately. An invoice will be sent to you in the coming days via email. 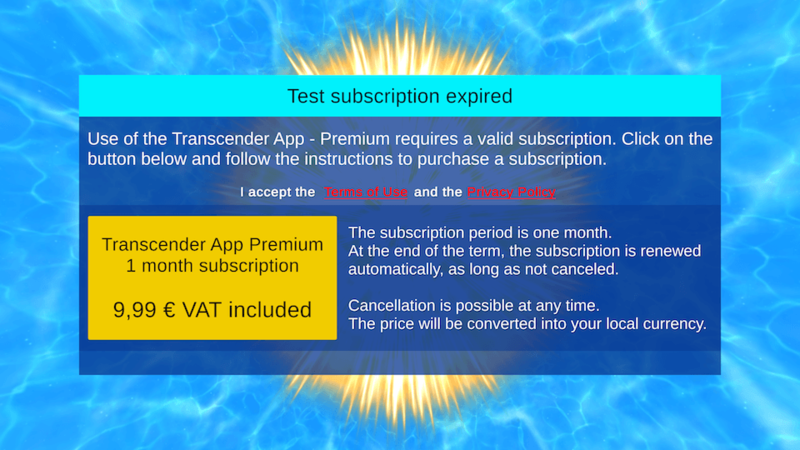 The Premium subscription will not be renewed automatically. A termination is not necessary. 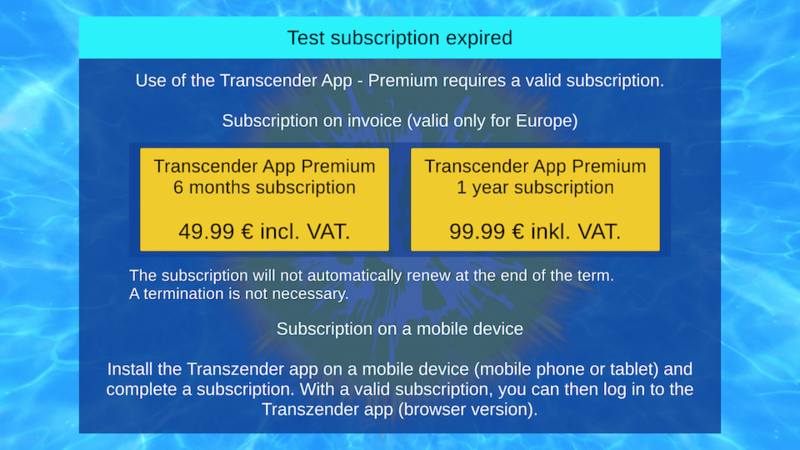 With a Premium subscription, you have the right and the option to use the Transcender App on both, your mobile devices and the web app browser version on a desktop PC. If you have any questions, suggestions, ideas, etc. 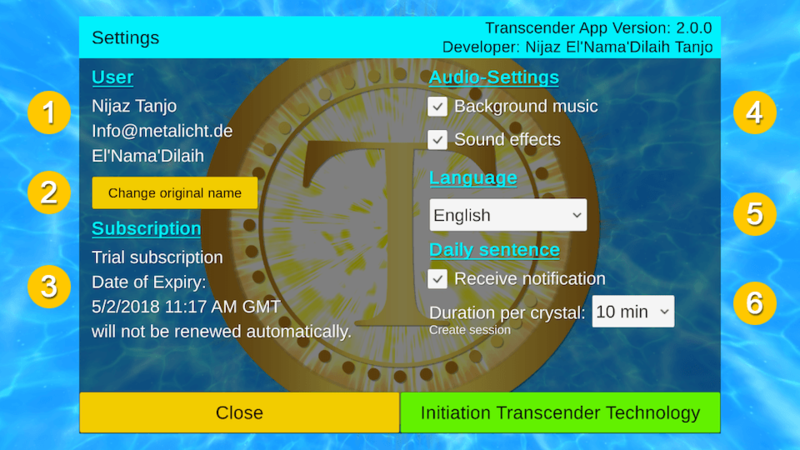 about the Transcender App, I am always at your disposal and happy about your message. 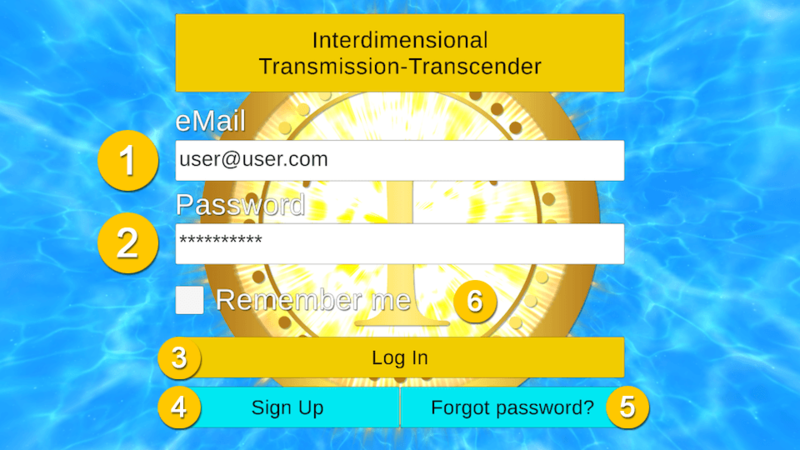 If you discover any bugs in the Transcender App, I would appreciate your feedback. In the case of a bug, it would be helpful for me if you could give me your device info, the version of the operating system and, if possible, send a picture.